NOTES: Yes, this is actually a GI Joe action figure from 1994. Many new adult collectors are surprised to discovery this wacky four-armed monster. 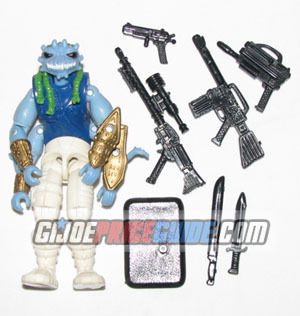 Predacon is an alien bounty hunter from the Star Brigade Lunartix Empire set of GI Joe figures. He is generally considered a Cobra figure, although I don't think he really has anything to do with Cobra. If you see a red Predacon, that is the Mexican version which is more rare and therefore more expensive.